I have the point missing off the top of my conservatory. Will this be a problem? 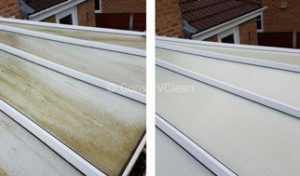 We assess your conservatory before we start to clean it and structural or other problems we may encounter. How long will it take to clean my conservatory? Do you stand on the conservatory? No, we have specialist access facilities and equipment that ensures we do not stand on your conservatory. How do you clean my conservatory? We use low pressure equipment to deliver water safely. This ensures minimal pressure on the seals around your conservatory. We have had specially developed environmentally friendly solution that is not harmful to plants and animals. My conservatory is green. Can you remove this? Why should my conservatory be cleaned when it goes green? The green coloured growth is usually caused by algae. This build up not only looks ugly but also obscures light from entering the conservatory. Algae begins to grow on the polycarbonate or glass and in some cases under the seals of the roof. This can force the seals apart over time and cause leaks into the conservatory. I have tried to clean the conservatory myself but it is still green. Can you help? In most cases, yes. 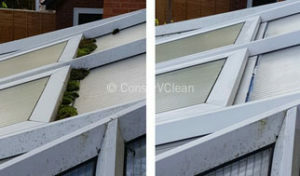 However, we have come across conservatories where the algae has been allowed to grow over the roof for several years. This has allowed the sun to bake a coating of the algae onto the roof making it impossible to remove and causing the roof to be permanently green. Yes, we clean you conservatory gutters as part of our service. 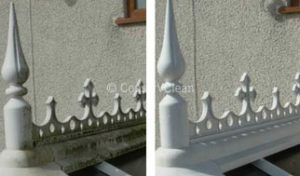 We can also clean house gutters and fascias around you house. This is at an extra cost. Do you have insurance for cleaning my conservatory? Unlike many companies which are only insured against causing damage to items which they are not working on, we are fully insured for cleaning conservatories.